So how did these flamenco dances come to be known as ida y vuelta? Literally, the words mean going and coming back - a billete de ida y vuelta is a return ticket - and in fact, it's a good description for how these flamenco palos came to be. As most people know, large areas of the Americas were once Spanish colonies, so it's no surprise that cultural influences traveled in both directions. At the end of the 19th century, when the Spaniards finally lost their foothold in Cuba, returning migrants brought their music with them. The new music was quickly adopted by flamenco performers and given a flamenco flavor - and voila, the cantes de ida y vuelta were born. One of the distinctive features of these palos is that they're cheerful! Most other flamenco songs tend to dwell on sadness and suffering - even Alegrias, in spite of the name meaning "joys", often turn out to be miserable when you translate them (my favourite is about a woman's sweetheart drowning at sea!). The other notable difference (for all except the Guajiras) is that they're in straightforward 4/4 time, instead of the traditional flamenco 12 beats. Although the music is still played in Spain, the dances themselves have fallen out of favor. However you'll often see them in student performances outside Spain, for two reasons. 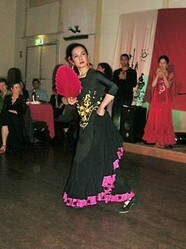 One is for the audience: non-flamenco audiences can get bored watching one dramatic footwork-dominated dance after another, and the cantes de ida y vuelta add variety with their lighter music and use of props like fans or shawls. The other is for the students: the rhythms are less complicated, and there's less fast footwork, so they're easier for students to master. Guajiras is the one cante de ida y vuelta that has the traditional 12-beat flamenco rhythm - but it 's still a light and airy style, often danced with fan (beautifully demonstrated in this clip). It's also known as punto cubano, and the lyrics are often about Havana. Another light, sunny style of music. Although the name "Colombianas" implies that it comes from Colombia, it's actually a Spanish-invented cante, based on the genuine Latin rhythms, which appeared around the 1940's. Often danced with fan or shawl. 4/4 rhythm. Tango aficionados will recognise this word as Argentinian. In this case it's a flamenco song, not a tango dance night! 4/4 rhythm. I had never seen it danced until I found this video clip! The rumbas is the most familiar to non-Spaniards, because it's the rhythm most often played by bands like the Gypsy Kings. 4/4 rhythm, sensuous, happy, with lots of flirty hip movements and skirt flicking! Flamenco purists tend to turn their noses up at it as "not flamenco", and I have to admit that when I dance rumbas, it feels more Latino than flamenco. This palo was one of the most popular when it first appeared - but I had never even heard of it until I came across the video below. Personally, I love the cantes de ida y vuelta - they never fail to put a smile on my face. They're also less technically challenging than "proper" flamenco dances, so they can be a welcome opportunity for dancers to relax and let their hair down for a while, in the middle of a long show! I love Flamenco so much, but it is definitely not for everyone... including myself. Marisa Wright is a dancer and freelance writer. She runs a number of websites and has written for Wizzley, HubPages and Squidoo.